Want to have more fishing buddies and get on any boat? Bring three girls that will go fishing in their bikinis and I guarantee you will get on damn near any guy’s boat. Just be careful because if it isn’t big enough, you might get bumped to make a spot for them! What Can I Say? Can’t see a lot of this hot fishing babe, but I can see that she has a cute little booty! I think it needs a good smack, what do you think? Who Is Ready For Bikini Weather To Return? I’m up in the Northwest and as I’ve said before, I’m jealous of the Florida guys because it is bikini weather here for like 3 days out of the year. Makes it hard to find hot girls to go fishing half naked with you. 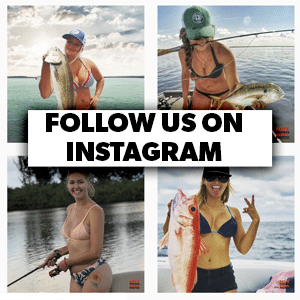 Hot Girls Like To Fish Too Here is a video that proves that hot girls like to go fishing too. This bikini wearing fishing girl is just out for some time on the water, but I’m pretty sure that we are more interested in her hot bikini than if this fishing gal is catching anything. Hot Fishing Girl In Just Her Bikini Nice blonde gal in a hot pink bikini out fishing? Yes please! I’ll take a hot fishing girl like her out any day! Nice Fish! Wish We Caught Ones Like That! OK, we would love to kick it with this hot fishing chick in her bikini as well. But seriously, wouldn’t you love to go fishing with a hot girl in a bikini like her?